Dendritic cells (DC)3 induce primary responses of CD4+ and CD8+ T cells (1). Ag taken up by DC is processed in endosomes and expressed at the cell surface in the form of peptides associated with MHC class II molecules, which stimulate CD4+ Th cells (2, 3). MHC class I-associated peptides, necessary for induction of responses of CD8+ T cells, were originally thought to be derived largely from endogenously synthesized proteins, such as viral Ag (4). It is now established that Ag presented to CD8+ T cells by DC may be acquired by endocytosis of exogenous Ag of several types. These Ag include those derived from infectious agents, dying cells, proteins associated with inert particles (5, 6), heat shock proteins (7, 8), or immune complexes (9, 10). Class I presentation of exogenous Ag usually requires its entry into the cytosol (9, 11), and is also called cross-priming (12), or cross-presentation (13). CD8+ T cell activation by cross-priming appears to be facilitated by the participation of Th cells (14, 15). Importantly, Th cell-dependent cytotoxic responses require the presentation of both class II-restricted and class I-restricted Ag by the same DC (16). This has led to the idea that Th cells actively modify DC, converting them into effective stimulators for induction of CTL from CD8+ cytotoxic precursors, and is part of a process called “conditioning” (17) or “licensing” (18) of DC. Th cells have been proposed to license DC for presentation of exogenous or endogenous Ag to CD8+ T cells in a way that depends on ligation of the CD40 molecules on DC (17, 19, 20). CD40 ligand-mediated cross-linking of CD40 molecules on DC led to high levels of expression of class II and costimulatory molecules and cytokine secretion by DC (21). However, CD40-independent pathways for induction of CTL by Th cells have also been documented (22, 23). Thus, we have an incomplete understanding of the mechanism by which Th cells license DC and the consequences of their licensing for CTL induction. DC can present peptides capable of direct binding to class I molecules to CD8+ T cells, in the absence of Th cells (24). This suggests a role for Th cells in licensing DC by other means than inducing expression of costimulatory molecules or cytokine production, such as by regulating class I Ag presentation. Here we investigate a possible role for Th cells in licensing DC for stimulation of cognate CD8+ T cells by their effects on the transport or processing of Ag by DC, resulting in an increase in expression of class I-associated peptide from the Ag. This was evaluated as a function of the form of the DC-presented class II Ag for which the Th cells are specific. Cognate Ag for Th cells was made available to DC as: 1) free peptide, which binds to empty MHC molecules at the cell surface; 2) free intact protein Ag, which requires intracellular transport and partial proteolysis for presentation; or as 3) Ag in hapten-bearing liposomes targeted for binding and uptake by a FcR for the Fc portion of IgG of DC. Our group (10, 25) has reported that DC from mouse bone marrow precursors, grown for several days in culture in the presence of GM-CSF, efficiently endocytose liposomes opsonized by IgG. FcR cross-linking leads to induction of maturation and expression of costimulatory molecules, and delivery of the Ag into compartments rich in class II molecules. Under such conditions, the Ag contained within liposomes is efficiently presented in the context of class II molecules and leads to stimulation of Ag-specific TCR-transgenic CD4+ T cells, even at very low levels of Ag (25). When DC were maintained in culture for periods longer than ∼12 days, they “spontaneously” (that is, without T cell help) presented class I-associated peptides from immune complexes (9), or FcR-targeted liposomes (10), to CD8+ T cells and induced CTL activity by these cells. Nevertheless, while bone marrow-derived DC harvested as soon as 4 days after initiation of DC culture presented exogenous Ag in the context of class II molecules to CD4+ T cells and stimulated the CD4+ T cells to produce lymphokines (10, 25), these short-term cultured DC very poorly stimulated CD8+ T cells specific for the same Ag (10). Known potent stimulators of the phenotypic maturation of DC, including LPS, agonist Abs to CD40, double-stranded RNA and IFN-γ, were unable to transform these short-term cultured DC into cells capable of inducing CTL activity in naive CD8+ T cells (10). Class I presentation of exogenous Ag thus appears not to be a constitutive, but rather an inducible, property of DC. We show in the present study that CD4+ T cells recognizing certain forms of cognate class II-associated Ag presented by short-term cultured DC are remarkably efficient in licensing DC for the presentation to CD8+ T cells of exogenous class I-restricted liposome-encapsulated Ag taken up by the FcR. The CD4 T cell signal provided to the DC is particular in that it requires peptide/class II complexes formed as a result of endocytosis. CD4 T cell signaling subsequently induces proteasome- and TAP-dependent Ag presentation in association with class I molecules, presumably following movement of Ag from endocytic vesicles to the cytosol. Those molecules that are necessary for signaling DC for class I presentation to CD8+ T cells resist extraction by dilute detergent and are sensitive to cholesterol depletion from the surface of DC. This is consistent with their concentration in cholesterol-rich lipid domains. We show that an important role of Th in licensing DC depends on engagement of these molecules and results in up-regulation of the expression of class I-associated peptides by DC for stimulation of cognate CD8+ T cells. OT-I mice (26) have CD8+ T cells transgenic for a TCR specific for the chicken OVA257–264 (SIINFEKL) peptide in the context of H-2Kb. OT-II mice (27) have CD4+ T cells transgenic for a TCR specific for OVA323–339 peptide in the context of H-2 IAb. These mice were provided courtesy of B. Heath (Walter and Eliza Hall Institute, Parkville, Victoria, Australia). They were maintained on the C57BL/6 (B6) background. KB5C0 mice (Ref. 28 ; B10.BR background) have CD8+ T cells transgenic for a TCR specific for peptides from ubiquitous mouse proteins in the context of H-2Kb (29), and were provided by A.-M. Schmitt-Verhulst (Centre d’Immunologie de Marseille-Luminy, Marseille, France). TCR-transgenic mice, which express the same TCR as 3A9 hybridoma specific for the immunodominant hen egg lysosome (HEL) 46–61 peptide in the context of IAk (Ref. 30 ; “3A9 mice”), were kindly provided by M. Davis (Stanford University, Palo Alto, CA). These were maintained on a CBA/J (CBA) background. Animals were treated according to institutional guidelines. T cells obtained from the spleens of transgenic mice 6–12 wk old were purified by passage over nylon wool columns. The IL-2-dependent line CTLL (31) and the H-2b RMA (32) lymphoma cell line were cultured in RPMI 1640 medium supplemented with 5% FCS, 50 μM 2-ME, 2 mM glutamine, and antibiotics, and for CTLL, with 10 U/ml of rIL-2 (Boerhinger Mannheim, Indianapolis, IN). DC derived from bone marrow of B6 (H-2b), CBA (H-2k) or (CBA × B6)F1 mice (Iffa Credo, L’Arbresle, France), or TAP1−/− mice on a B6 background (Jackson Laboratories, Bar Harbor, ME), were cultured for 3 days in DMEM supplemented with 10% FCS, antibiotics, 2 mM glutamine, 50 μM 2-ME, and 30% conditioned medium from NIH3T3 cells containing GM-CSF, provided by J. Davoust (Institut Curie, Paris, France), as described (33). They were then diluted 1/1 in the same medium and after an additional period of 3–4 days of culture, plastic nonadherent cells were washed, resuspended in supplemented RPMI, and used as APC. The phenotype of these cells has been reported previously (10). U7.27.7, a hybridoma producing an anti-DNP Ab was provided by Z. Eshhar (Weizmann Institute, Rehovot, Israel). Use of the mAbs 10.2.16, specific for IAk and 5F1, specific for H-2Kb have been described (10). All of these mAbs are mouse IgG2a. MR-1 (34) (provided by R. Noelle, Dartmouth University, Lebanon, NH) is a hamster mAb specific for CD154 (CD40L). 25-D1.16 is a mouse IgG1 mAb specific for SIINFEKL peptide associated with H-2Kb (35). It was kindly provided by A. Porgador and R. Germain (National Institute of Allergy and Infectious Disease, National Institutes of Health, Bethesda, MD). These mAbs were purified over protein G-Sepharose columns (Amersham Pharmacia Biotech, Piscataway, NJ). Fluorescent mAbs specific for CD4, CD8, and CD69 were purchased from BD PharMingen (San Diego, CA). Liposomes were made from 65% (mol/mol) dimyristoyl phosphatidylcholine, 34.5% cholesterol (Sigma Aldrich, St. Louis, MO), and 0.5% DNP-caproyl-phosphatidylethanolamine (Molecular Probes, Eugene, OR) and formed by exposing lipids evaporated from organic solvents to 60 mg/ml (1.4 mM) OVA (grade VII, Sigma Aldrich) or 60 mg/ml OVA and 2 mg/ml (1.4 mM) synthetic HEL 46–61 peptide (HEL46–61) (Centre d’Immunologie de Marseille-Luminy Protein Synthesis Facility) in PBS containing 10 mM CFSE (Molecular Probes) (10). Following several cycles of freezing and thawing, liposomes were extruded (Extruder; Lipex Biomembranes, Vancouver, British Columbia, Canada) 5–10 times through polycarbonate filters of 200 nm pore size at 40°C, followed by gel filtration to eliminate unencapsulated solute. Lipid vesicles were sterilized by filtration through 0.45-μm filters. At the concentration of OVA and HEL46–61 used, individual liposomes contain ∼3000 molecules of each encapsulated protein or peptide. The amount of liposome-associated Ag used for presentation experiments was obtained by serial dilutions of a stock preparation of these liposomes. All Ag stocks were tested for endotoxin with a Limulus amebocyte assay (BioWhittaker, Walkersville, MD), and if necessary, passed over Acticlean Etox columns (Sterogene Bioseparations, Carlsbad, CA) for endotoxin depletion. The cell-permeable proteasome inhibitor MG-132 (Z-Leu-leu-Leu-CHO; Ref. 36) was purchased from Euromedex. Methyl-β-cyclodextrin (MCD) and Triton X-100 were from Sigma Aldrich. A total of 2 × 104 (or as indicated) DC were incubated in 100 μl supplemented RPMI, in duplicate wells of 96-well flat-bottom tissue culture plates. Free OVA peptide SIINFEKL, HEL46–61 or HEL or OVA, or liposome-encapsulated Ag at the indicated concentrations were added overnight, in the presence or absence of targeting anti-DNP mAb (5 μg/ml). DC were then washed before the addition of 104 T cells from CD4+ TCR-transgenic mice in supplemented RPMI for 72 h, at which time supernatant fluids were harvested for determination of IL-2 secretion based on a bioassay using the IL-2-dependent cell line CTLL. The IL-2 values in U/ml were derived from a standard curve using CTLL in the presence of recombinant mouse IL-2. Washed CTLL were incubated with harvested supernatants overnight and 0.25 μCi of [3H]thymidine (NEN, Boston, MA) were then added during 6 h.
For T cell cytotoxicity, 104 T cells from CD4+ TCR-transgenic and/or 2 × 104 T cells from CD8+ TCR-transgenic mice were incubated as above, and their capacity to induce cytotoxicity was evaluated after 5 days for OT-I, or 3 days in the case of KB5C20 T cells by the just another method test (37). Cells were incubated for 4 h with 5,000 RMA cells which were previously [3H]thymidine-labeled (0.25 μCi/ml) and OVA peptide SIINFEKL-pulsed (1 μM) overnight and washed. In each case, cells were harvested and radioactivity in DNA was counted by scintillation. Under these conditions, 5,000 RMA cells incorporated 7,000–14,000 cpm. Lysis induced by OT-I cells in the presence of DC incubated without Ag was indistinguishable from that of RMA cells incubated alone. This value was taken as 100% viable cells. Maximum lysis using these cells was ∼70% of incorporated [3H]thymidine, obtained by incubation of cells in Triton X-100 and DNase. For FACS determination of expression of all H-2 Kb molecules or the subpopulation of Kb molecules associated with the SIINFEKL peptide, 2 × 105 B6 DC were incubated as indicated, alone or with free OVA, free SIINFEKL, OVA encapsulated in DNP-bearing liposomes, or OVA in DNP-bearing liposomes in the presence of 5 μg/ml of anti-DNP. In some experiments, after an overnight incubation at 37°C, cells were washed and incubated in the presence or absence of 2 × 105 IAb/OVA peptide-specific CD4+ T cells from OT-II mice. After 24 h incubation, cells were washed and incubated at 4°C with anti-Kb mAb 5F1 or anti-Kb/SIINFEKL complex-specific mAb 25-D1.16. Cells were then washed and incubated with a biotin-labeled goat-anti-mouse IgG Ab for 30 min, then after washing, with FITC-labeled streptavidin. The IgG2a anti-DNP mAb used for FcR targeting of liposomes was not detected by this second Ab. Cells were then fixed in 2% formaldehyde and analyzed by FACS. When incubated with CD4+ T cells from OT-II mice, the fluorescence was gated on the DC population, which separated easily from T cells on the basis of the forward angle and side-scatter profiles. For CD69 expression on CD4+ and CD8+ T cells, DC were incubated with Ags as described for 24 h. Cells were then washed and incubated for 48 h with CD4+ and/or CD8+ T cells. CD69 expression was determined by double staining of T cells with either PE-CD8- and FITC-CD69-specific mAb (in the case of CD8+ T cells) or PE-CD4- and FITC-CD69-specific mAb (in the case of CD4+ T cells). We investigated the role of CD4+ Th cells in the expression by DC of the OVA-derived SIINFEKL peptide in association with the Kb molecule. We first calibrated the system to demonstrate the ability to discriminate binding of the SIINFEKL/Kb complex-specific mAb, 25-D1.16 (35), relative to the total number of H-2Kb molecules detected by a pan-specific anti-Kb mAb, 5F1 after incubating DC from B6 mice with 10 μM free SIINFEKL. The results are presented as a histogram showing all Kb molecules and those which express the SIINFEKL/Kb complex at the surface of DC at 24 h (Fig. 1⇓A). As seen in Fig. 1⇓B, DC incubated in the presence of increasing doses of free SIINFEKL showed marked increases in binding of the SIINFEKL/Kb specific mAb 25-D1.16. In Fig. 1⇓C, DC were incubated as above for 24 h with the indicated concentrations of free SIINFEKL, free OVA, OVA in DNP-bearing liposomes without (Lipo OVA), or with 5 μg/ml anti-DNP (FcR Lipo OVA). They were then incubated for an additional 24 h in the presence or absence of Th cells from OT-II mice. The presence of OT-II T cells did not result in increased Kb association of free SIINFEKL, but was required for expression of the SIINFEKL/Kb complex by DC incubated with exogenous OVA. When OVA was contained in liposomes targeted to the FcR of the DC the SIINFEKL epitope was expressed by DC in association with a larger number of Kb molecules than when the DC were incubated with free SIINFEKL at equivalent concentrations (Fig. 1⇓C). This increase occurred without significant change in the total number of Kb molecules expressed by the cells, as revealed by mAb 5F1-binding (data not shown). We next evaluated the role of OT-II Th cells in the activation of OT-I cells and induction of cytotoxicity. DC were incubated as above with various forms of OVA in the presence or absence of OT-II cells and in the presence of OT-I cells. CD69 expression by OT-I cells was markedly induced to exogenous OVA only when they were incubated together with OT-II cells and was most efficient when OVA was taken up in opsonized liposomes. 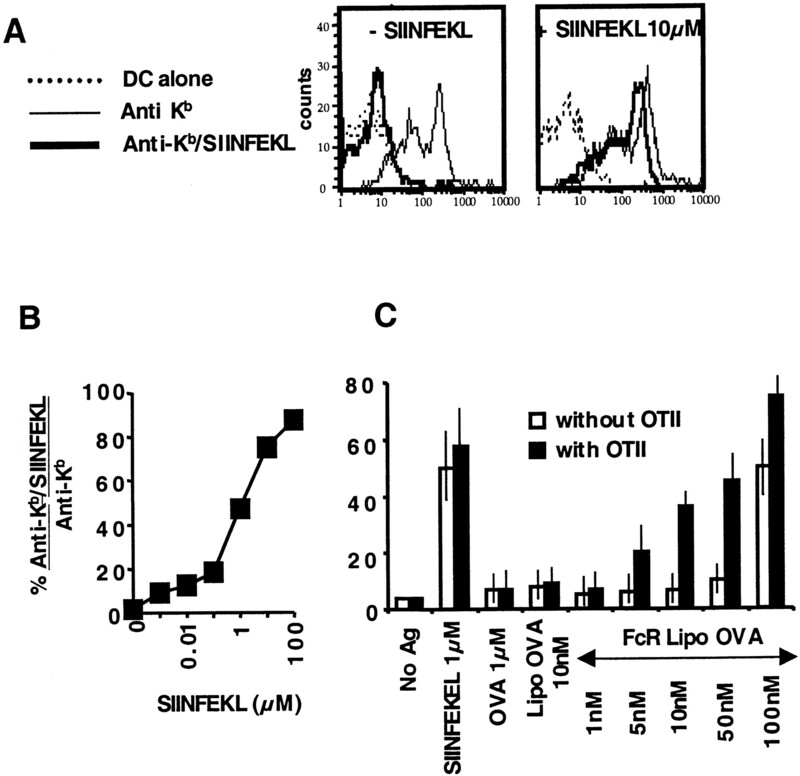 The presence of OT-II cells did not increase activation of OT-I cells exposed to DC incubated with free SIINFEKL (Fig. 2⇓A). OT-II cells were also required for the presentation by DC of exogenous OVA, but not free SIINFEKL, for the induction of cytotoxicity by OT-I cells for SIINFEKL-pulsed targets (Fig. 2⇓B). Presentation in unopsonized liposomes or as free OVA required at least 10,000 times more Ag for cytotoxicity by OT-I cells than FcR-targeted liposomes (Fig. 2⇓B). Neither 25-D1.16 mAb binding, CD69 expression, nor cytotoxicity were observed in the absence of OT-II T cells for levels of OVA less than 10 nM, or when either of the Ag-specific CD4+ or CD8+ T cells were replaced by T cells from non-TCR-transgenic mice. Similarly, OT-II cells incubated with DC and OVA but without OT-I cells were not cytotoxic in this assay (not shown). The results indicate that CD4 T cells responding to their cognate Ag taken up in DC by endocytosis after FcR binding are required in responses of CD8+ T cells to another peptide determinant derived from the same Ag presented in the context of MHC class I.
MHC class I-restricted presentation of FcR-targeted exogenous Ag to CD8+ T cells by DC is induced by CD4+ T cells recognizing their cognate Ag. A, DC were incubated with different forms of Ag as described in Fig. 1⇑C. The concentration of all Ag was 10 nM. After overnight incubation, they were also incubated with 2 × 104 Kb/SIINFEKL-specific T cells from OT-I transgenic mice, in the presence or absence of T cells from OT-II mice. After 24 h incubation at 37°C, activation of the OT-I T cells was revealed by CD69 expression of CD8+ T cells. The number expressed as a percentage refers to the fraction of CD8+ T cells that are CD69+. Histograms represent data from 50,000 cells. Results are representative of three experiments. B, A total of 2 × 104 DC were incubated with different forms of Ag at different concentrations. After an overnight incubation at 37°C, cells were washed and incubated with 2 × 104 OT-I alone (right panel), or in the presence of 104 OT-II (left panel). CTL activity was determined after 5 days. Curves show the results of one experiment, representative of results of five independent experiments. We analyzed the role of Ag processing by DC in CTL induction. Bone marrow-derived DC from normal B6 mice or from B6 mice in which the TAP1 gene had been deleted (38) were incubated with the SIINFEKL peptide, or with OVA encapsulated in DNP-bearing liposomes targeted to the FcR with the anti-DNP mAb. The proteasome inhibitor, MG-132 (1 nM) was added to some wells. 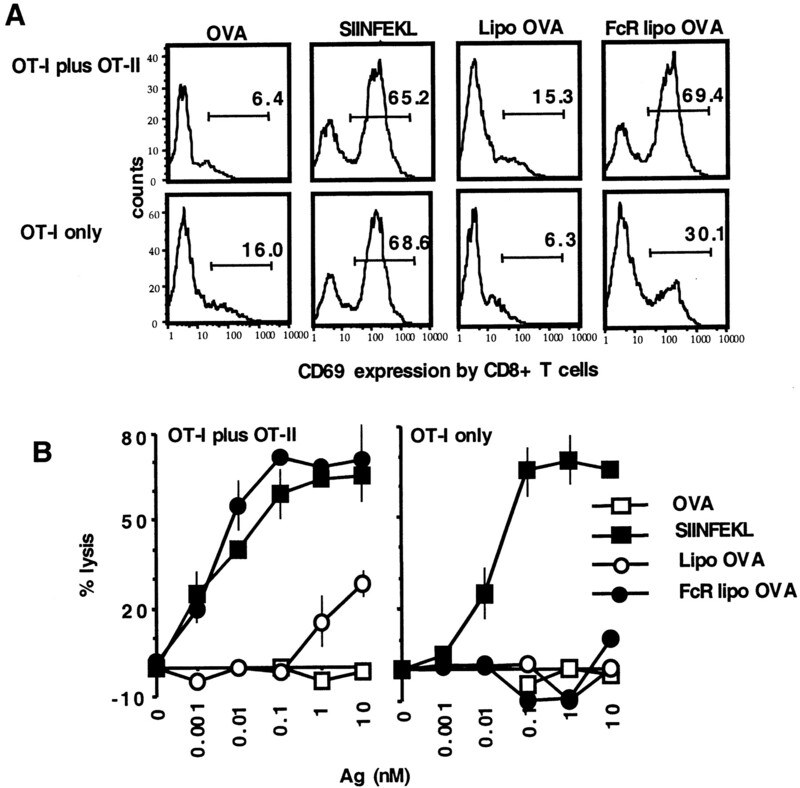 OT-I and CD4+ OVA-specific OT-II T cells were then added, and lysis by OT-I cells determined as in Fig. 2⇑. Results for CTL responses are presented in Fig. 3⇓A. The proteasome inhibitor MG-132 reduced induction of CTL (Fig. 3⇓A) by normal DC for targeted liposomes containing OVA to levels equivalent to the very low presentation observed for the TAP1−/− DC. Similar effects were seen when another proteasome inhibitor, lactacystin, was used (data not shown). There was no effect of the proteasome inhibitor MG-132 on CTL induced by normal or TAP1−/− DC pulsed with the OVA peptide SIINFEKL (Fig. 3⇓A). There was also no effect of MG-132 on class II-mediated presentation by normal (or TAP1−/−DC, not shown) to OT-II cells of Ag contained in FcR-targeted liposomes (Fig. 3⇓B). Thus, induction of class I-restricted CTL by FcR-targeted Ag on DC requires passage of Ags contained in endocytic vesicles into the cytosol to be processed in a classical proteasome- and TAP-dependent mechanism for generation of SIINFEKL from OVA. Taken together, these results indicate that an important role of Th cells in CD8+ T cell activation is through their effects on the level of exogenous Ag processing and presentation in association with class I molecules of DC. Induction by CD4+ T cells of MHC class I-mediated presentation of exogenous Ag by DC is proteasome- and TAP-dependent. A, A total of 2 × 104 DC from B6 or B6 TAP1−/− bone marrow were incubated with 1 nM free SIINFEKL or 1 nM OVA encapsulated in DNP-bearing liposomes targeted to the FcR by anti-DNP mAbs, alone or together with 1 nM of the proteasome inhibitor MG-132 for 1 h at 37°C. DC were then washed and incubated with 104 T cells from OT-II and 2 × 104 T cells from OT-I mice. Cytotoxicity was evaluated as described in Fig. 2⇑. B, DC were incubated with serial dilutions of FcR-targeted liposomes containing OVA with or without 1 nM proteasome inhibitor, or with untargeted liposomes, as described in A. Cells were thereafter incubated with 2 × 104 T cells from OT-II mice. IL-2 secreted by Ag-specific CD4+ T cells was measured after 48 h. Curves are representative of results obtained in two experiments. The data in Figs. 1–3⇑⇑⇑ indicate that Th cells act on the DC not simply by up-regulating costimulatory molecules but in a manner necessary for proteasome-dependent OVA processing or presentation. Since the OVA peptide SIINFEKL was presented by DC to CD8+ OT-I T cells whether or not CD4+ OT-II T cells were present (Fig. 2⇑B), the requirement for costimulation by DC for activation of CD8+ T cells may be modulated by a sufficient density of peptide ligand. The induction of cytotoxicity requiring Th cells could, however, be related to other effects of Th cells on CD8+ T cells, as by release of lymphokines (23), or by direct effects on the DC, related to their “conditioning” (17). To discriminate between these possibilities we incubated DC from CBA mice, together with DC from B6 mice, with FcR-targeted liposomes containing OVA. We added OT-I CD8+ T cells, restricted by Kb, and provided help with HEL-specific Th cells, which recognize the HEL46–61 in the context of IAk (39). HEL was added as the free protein (100 nM). In this form it is taken up by fluid-phase endocytosis and processed in endocytic vesicles, but because this uptake is inefficient it requires higher Ag concentrations than when the Ag is encapsulated in targeted liposomes. We compared the induction of a cytotoxic response to that in cultures containing the same T cells incubated with DC from (CBA × B6)F1 mice. As shown in Fig. 4⇓A, (CBA × B6)F1 DC were able to induce cytotoxicity by OT-I cells at OVA concentrations 1000-fold lower than a mixture of CBA plus B6 DC, when HEL peptide/I-Ak-specific Th cells were provided in the presence of HEL. This confirms and extends to another Ag the results presented in Fig. 2⇑ using OT-II Th cells. The use of an independent Ag as a source of class II-associated peptides permits us to conclude that induction of cytotoxicity requires expression of both class II- and class I- restricted determinants on the same DC, as reported for cross-presentation in vivo (27). Because in the presence of HEL both the CBA and F1 DC fully stimulated IL-2 production by, and activated the 3A9 CD4+ T cells (Fig. 4⇓B); the activity of Th cells necessary for induction of CTL appears to be directed to the DC, rather than the CD8+ T cells. Addition of LPS to the culture medium did not change this result (not shown), ruling out any possible participation of even the very low level of endotoxin in the HEL preparation to explain the stimulatory activity of the HEL. These data are in agreement with the report of Lu et al. (23), indicating that ILs secreted by CD4+ T cells cannot replace those cells for licensing of DC. The activity of Th cells on DC resulted in increased efficiency of class I-restricted presentation of Ag by DC to induce a cytotoxic response. In Fig. 4⇑C, we show that 1,500 DC were as effective at stimulating cytotoxicity by OT-I T cells in the presence of HEL-specific T cells and HEL as 25,000 DC with the same Th cells, but without HEL. The provision of cognate CD4+ T cell help is thus essential for the induction of CD8+ T cell cytotoxicity to OVA through acquisition by DC of the capacity to process the CD8 epitope. However, the action of the Th cells on induction of cytotoxicity was not confined to the processing of epitopes of exogenous Ag. The same F1 DC were incubated with HEL-specific CD4+ cells and CD8+ T cells from KB5C20 transgenic mice, specific for a peptide derived from an endogenous DC protein presented in the context of Kb (28). We observed that a modest but reproducible increase in responses (2- to 4-fold reduction in the number of DC necessary to stimulate a response) was obtained when they were incubated with FcR-targeted liposomes in the presence of HEL, while the same liposomes had little effect in the absence of HEL (Fig. 4⇑D). The Kb dependence of the responses of both OT-I and KB5C20 cells was confirmed by blocking with the anti-Kb mAb, 5F1 (Figs. 4⇑, C and D). OT-I responses dependent on 3A9 Th cells were also blocked by Ab to CD154 and IAk, (data not shown), confirming the CD40 and class II dependence of the response. These data indicate that responses by CD8+ T cells specific for class I-associated peptides derived from endogenous Ag may also be helped by CD4+ T cells, though this help does not appear to be critical for the response as it appears to be for peptides derived from exogenous Ag. The mechanism of interaction between Th cells and DC was investigated. As shown above, cytotoxicity by OT-I cells, absent without help, was efficiently induced to FcR-targeted OVA in the presence of HEL-specific Th cells and 100 nM free HEL (Fig. 5⇓A). Surprisingly, induction of a cytotoxic response to OVA in opsonized DNP-bearing liposomes was not obtained when 100 nM free HEL46–61 was used (Fig. 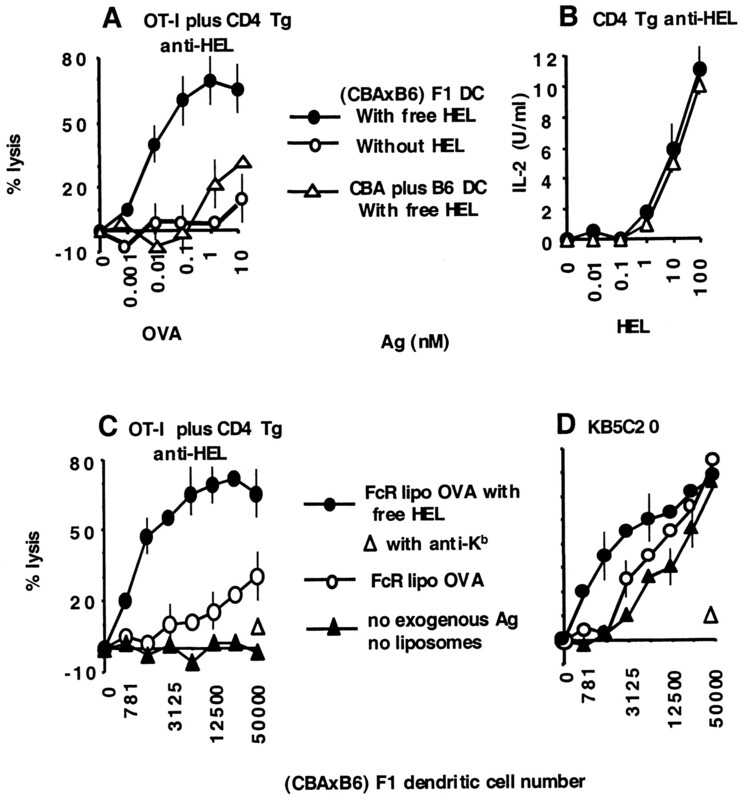 5⇓A), instead of free HEL as a source of Ag for CD4+ specific T cells. Despite the lack of activity of free 46–61 in helping cytotoxicity of OT-I cells, coencapsulation of 46–61 with OVA in opsonized liposomes permitted efficient help for induction of cytotoxicity by OT-I cells, even at very low concentrations of both OVA and the HEL peptide (Fig. 5⇓A). Strikingly, the inducible cytotoxic response to 1 nM OVA coencapsulated with equimolar HEL46–61 in FcR-targeted liposomes was inhibited by free 100 nM HEL46–61 (Fig. 5⇓A), while this same concentration of free HEL46–61 had no effect on presentation of free SIINFEKL to OT-I (Fig. 5⇓A, inset, right panel). Induction of cytotoxicity depends on the manner in which class II-peptide complexes are formed. A, A total of 2 × 104 (H-2k × b)F1 DC were incubated with 1 nM OVA contained in FcR-targeted liposomes, alone or with 100 nM free HEL, or with 100 nM free HEL46–61 as indicated (left panel); with 1 nM OVA and 46–61, both contained in FcR-targeted liposomes, without or with 100 nM free HEL46–61 (right panel); or with 1 nM SIINFEKL without or with 100 nM free HEL46–61, (inset in right panel). After an overnight incubation, cells were washed and incubated with 2 × 104 OVA-specific (OT-I) and 104 HEL-specific (3A9) T cells. After an additional 5 days of culture, cytotoxicity was determined as in Fig. 2⇑. B, left panel, A total of 2 × 104 (H-2k × b)F1 DC were incubated with different amounts of free HEL or HEL46–61 and 2 × 104 3A9 T cells were added for 48 h and IL-2 was measured as described in Fig. 4⇑. B, right panel, Percentage of 3A9 CD4+ T cells positive for CD69 after 24 h incubation was evaluated with PE-labeled CD4- and FITC-labeled CD69-specific Abs. The number expressed as percentage refers to the fraction of CD4+ T cells that are CD69+. In contrast to their differential effects in stimulating T cell help for cytotoxicity, both HEL and free HEL46–61 promoted similar CD4+ T cell activation with respect to IL-2 secretion or expression of CD69 (Fig. 5⇑B), when present at concentrations of 10 nM or higher. This confirms that free HEL46–61 stably binds to accessible IAk molecules, as previously shown for B lymphoma cells using radiolabeled peptides (40). We conclude that class II molecules of DC that were loaded with peptides derived from free HEL, or liposome-encapsulated HEL46–61 or HEL in the interior of the endocytic pathway, elicit different responses from Ag-specific CD4+ T cells with respect to DC activation for class I presentation than class II molecules loaded with free HEL46–61 at the cell surface. Naive T cells depend for their activation on contact with Ag peptides on the surface of DC. TCR-clustering in cholesterol-rich lipid domains has been reported to follow its cross-linking, and may be necessary for T cell activation (41). TCR cross-linking in Ag-naive CD4+ T cells would be expected to be affected by class II-peptide concentration and organization in DC (3). We consequently evaluated the role of cholesterol rich lipid domains of DC in the stimulation of Th cells. Cholesterol-rich domains resist extraction by cold Triton X-100 (reviewed in Ref. 42). DC which had either been incubated overnight with FcR-targeted HEL46–61 in liposomes or HEL, or pulsed with HEL46–61 peptide were treated with low concentrations of Triton X-100 for 30 min, followed by washing and incubation with HEL-specific CD4+ T cells. As shown in Fig. 6⇓A (left panel), IL-2 production by Th cells in contact with DC incubated with 10 nM free HEL46–61 was inhibited by treatment of those DC to dilute Triton X-100. In the same experiment, Th incubated with DC incubated with low concentrations (0.1 nM) of HEL46–61 in targeted liposomes, or 10 nM HEL taken up by endocytosis were insensitive to the effects of Triton X-100 treatment of those DC. Concentrations greater than 0.001% Triton X-100 (10 μl Triton X-100/L in the incubation solution) were toxic for DC. We also treated DC with MCD after Ag uptake. This agent chelates membrane cholesterol and disperses membrane rafts (43, 44). As shown in Fig. 6⇓A (right panel), IL-2 production by Th cells stimulated by HEL or FcR-targeted HEL46–61 was abolished after MCD treatment. Effective doses of the same drug had no effect on activation of CD4+ T cells by DC treated after HEL46–61-pulsing. Together, these data demonstrating different susceptibility to pharmacological inhibition indicate that class II-associated peptides exist in different environments, depending on whether the peptide was loaded onto class II molecules in endocytic vesicles or at the cell surface. CD4+ T cell activation of DC that endocytosed Ag can be inhibited by treating DC with MCD but not with dilute Triton X-100. A, A total of 2 × 104 (H-2k × b)F1 DC were incubated with the indicated concentrations of free HEL or HEL46–61, or OVA and HEL46–61 coencapsulated in FcR-targeted liposomes. After overnight incubation, they were washed and treated with different concentrations of Triton X-100 for 30 min at 4°C, or with indicated concentrations of MCD in complete medium for 1 h at 37°C, before re-washing and addition of 2 × 104 HEL-specific CD4+ T cells. After 48 h incubation, supernatants were harvested for IL-2 determination, as described in Fig. 4⇑. Data are representative of those obtained in five different experiments. B, A total of 2 × 104 (H-2k × b)F1 DC were incubated overnight with 1 nM OVA and HEL46–61 contained in FcR-targeted liposomes (left panel), or with 1 nM free SIINFEKL (right panel). Cells were then untreated or incubated with 5 mM MCD for 1 h before addition of OT-I T cells with HEL-specific 3A9 Th cells. Representative of five experiments. We next examined the effect of cholesterol depletion of DC on induction of cytotoxic responses by CD8+ T cells (Fig. 6⇑B). CTL activity induced in OT-I T cells by DC presentation of OVA and HEL46–61 contained in FcR-targeted liposomes in the presence of HEL-specific CD4+ T cells was abolished when the DC were incubated with 5 mM MCD after Ag uptake (left panel). These results strongly suggest that intracellular transport and processing of endocytosed Ag for class I presentation by DC highly depends on CD4+ T cell interaction with class II-peptide complexes concentrated in cholesterol-rich domains. The presentation of SIINFEKL was only slightly affected when DC were treated with MCD after SIINFEKL pulsing (right panel). This indicates that MCD acted on DC, rather than on the T cells that were added to cultures after a washing step. The data also suggest that class I-peptide complexes of DC need not be concentrated in cholesterol-rich domains for stimulation of CTL responses by CD8+ T cells. In this paper, we investigate the process whereby CD4+ T cells “license” DC for stimulation of cytotoxic responses by CD8+ T cells to exogenous Ag. We had previously shown that binding of OVA-containing liposomes to the FcR was necessary for the CD4 T cell-independent presentation of OVA in the context of class I by long-term cultured DC (10), as it was for presentation of immune complexes by long-term cultured DC and DC lines (9). Here we show that CD4+ T cells recognizing their cognate Ag presented by short term cultured DC increased expression by the DC of the fraction of class I-molecules associated with the SIINFEKL peptide processed from OVA encapsulated in opsonized liposomes (Fig. 1⇑C), without markedly increasing the total expression of class I molecules (not shown). This increase of SIINFEKL presentation was not mediated by induction of the immunoproteasome, because it is constitutively expressed in DC, even if up-regulated during maturation of DC (45). Furthermore, treatment of DC with IFN-γ did not eliminate the requirement for CD4+ T cells interacting with DC for class I presentation (Ref. 10 and data not shown). These Th cells were also necessary for up-regulation of CD69 expression and cytotoxicity by naive OT-I CD8+ T cells (Fig. 2⇑, A and B) to OVA endocytosed by DC. This indicates that licensing of DC by Th cells for the stimulation of CD8+ T cells augments the expression of class I-associated peptides by DC, by an effect of Th cells on the transfer to the cytosol from endocytic vesicles, processing or transport of exogenous Ag. This does not rule out other roles for Th interacting with DC which contribute to the process of licensing, but it seems to be a very important component of licensing for responses to exogenous Ag. Although we observed that Th cells were not necessary for induction of OT-I cytotoxicity to DC pulsed with SIINFEKL (Fig. 2⇑B), or for presentation of an endogenous self-peptide to alloreactive KB5C20 cells (Fig. 4⇑D), both of these responses occurred at 2- to 10-fold lower Ag concentrations when Th cells were stimulated by a cognate ligand presented by DC. These effects on cytotoxity measured after several days of culture may be related to Th cell effects on DC survival and persistence of Ag presentation, which appear to be dictated in part by CD154-CD40 interactions (46). DC bearing class II molecules loaded with either endocytosed HEL or exogenous free HEL46–61 peptide at levels of 10 nM or higher stimulated cytokine release by 3A9 CD4+ T cells (Fig. 5⇑B), confirming the published observation that the HEL46–61 peptide is a full agonist of 3A9 Th cell stimulation for IL-2 production (47). Nevertheless, binding of HEL46–61 as an exogenous peptide appeared insufficient for transmission of signals from the Th cells into the DC. These CD4+ T cells failed to stimulate DC to present peptides derived from exogenous OVA in association with class I molecules. Indeed, exogenous HEL46–61 inhibited the efficient CD4+ T cell-dependent CD8+ T cell stimulation by HEL46–61 peptide encapsulated in liposomes delivered into endocytic vesicles after FcR-binding (Fig. 5⇑A). The fact that DC that have endocytosed peptides are differently susceptible to pharmacological manipulation by MCD and Triton X-100 than cells that have been pulsed with peptides strongly indicates that different pools of class II molecules have been addressed. These data are consistent with the hypothesis that some signals from Th cells necessary for licensing DC originate from the TCR of Th cells and pass through Ag-loaded class II molecules concentrated in cholesterol rich domains of DC. These signals may be transmitted through class II molecules alone or in conjunction with signals through other molecules known to be concentrated in lipid domains, including CD40 (48). Cross-linking of class II molecules on human myelomonocytic cells led to phosphorylation of associated Src-family kinases, in a manner which required the presence of class II molecules in lipid rafts (43). It is interesting that class II molecules of B cells have been reported to acquire the capacity to transduce signals leading to phosphorylation of Src-kinases and Ca2+ mobilization by virtue of their association with immunoreceptor tyrosine-based activation motif (ITAM)-motifs in Ig-associated Igα and Igβ (49). We are investigating the possibility that a role analogous to ITAM of Igα and Igβ may be played by FcR-associated ITAM sequences in signaling via class II molecules after re-expression at the cell surface in cholesterol-rich domains. The combined roles of the FcR as an Ag receptor, as a molecule signaling for the maturation of DC and as a transducer of signals from the TCR of Th cells may collectively account for its remarkable efficacy as a target for Ag delivery for both class II- and I-restricted responses. These experiments suggest a model for at least part of the role of CD4+ T cells in licensing DC for cross-presentation of exogenous Ag to CD8+ T cells. Ag binding to a suitable receptor on DC is taken up by endocytosis into vesicles where, following release and partial proteolysis, peptides associate with relevant class II molecules. These peptide-loaded class II molecules are expressed at the cell surface concentrated in cholesterol rich domains, probably in association with other molecules necessary for signaling. Contact with cognate Th cells results in cross-linking of the TCR and up-regulation of ligands including CD 154 in these cells, inducing stimulation of DC through class II, CD40, and additional molecules. These signals open endocytic compartments in DC, releasing remaining Ag into the cytosol where it follows the classical proteasome and TAP-dependent class I pathway for presentation. DC pulsed with peptides that associate with class II molecules at the DC surface are not concentrated in lipid domains. At sufficiently high concentrations these class II-peptide complexes activate cognate Th cells, but do not transmit signals from these cells permitting presentation of class I-associated Ag by DC. In line with these results it is interesting that administration in mice of tumor Ag-derived class II associated peptides, which can stimulate T cell-dependent delayed hypersensitivity and Ab responses, has recently been shown to enhance rather than inhibit tumor growth (50). Taken together, these data suggest that the manner in which class II molecules of DC are loaded with Ag-derived peptide may have important consequences for immune responses they induce. We thank Laurent Giraudo for technical assistance, Hervé Sanchez for animal care, Anne-Marie Schmitt-Verhulst, Sylvie Guerder, Hai-Tao He, Philippe Naquet, and Philippe Pierre for helpful discussions and criticism of the manuscript, and Bernard Malissen for support and encouragement. 1 These studies were supported by institutional grants from Institut National de la Santé et de la Recherche Médicale and the Centre National de la Recherche Scientifique, by a grant from the Association Pour la Recherche sur le Cancer, and by Contracts QLG1-1999-00622 and BMH4-CT97-2503 from the European Community. K.S. was supported by fellowships from the Ministère de l’Education Nationale de la Recherche et de la Technologie and from the Association Pour la Recherche sur le Cancer. 3 Abbreviations used in this paper: DC, dendritic cells; HEL, hen egg lysosome; MCD, methyl-β-cyclodextrin; ITAM, immunoreceptor tyrosine-based activation motif.